This book explores the history of hypertext, an influential concept that forms the underlying structure of the World Wide Web and innumerable software applications. This book explores the history of hypertext, an influential concept that forms the underlying structure of the World Wide Web and innumerable software applications. Barnet combines an analysis of contemporary literature with her exclusive interviews with those at the forefront of the hypertext innovation. She tells both the human and the technological story, tracing its path back to an analogue device imagined by Vannevar Bush in 1945, before modern computing had happened. 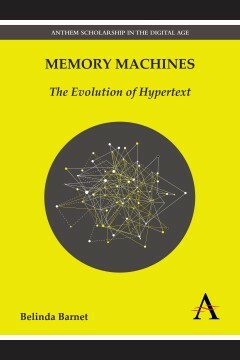 ‘Memory Machines’ offers an expansive record of hypertext over the last 60 years, pinpointing the major breakthroughs and fundamental flaws in its evolution. Barnet argues that some of the earliest hypertext systems were more richly connected and in some respects more flexible than the Web; this is also a fascinating account of the paths not taken. Barnet ends the journey through computing history at the birth of mass domesticated hypertext, at the point that it grew out of the university labs and into the Web. And yet she suggests that hypertext may not have completed its evolutionary story, and may still have the capacity to become something different, something much better than it is today. Belinda Barnet is a lecturer in media and communications at Swinburne University, Melbourne, Australia.